My newest obsession is clearly black and white infrared film. It has totally blown my mind away. And for comparison, I dragged my Wista out for a walk in the woods a day last week. It was a warm and sunny day, but as you can see, the sun does not reach to the deepest green. And that was what I was curious about. How would infrared film cope with that? I think it did a glorious result. How can I not fall in love with infrared…..
What do you think? Which of the two is your favorite? And help me now, HOW can we together shout so loud that the producers of film will again take this amazing film in production? I too mourn the loss of Efke IR820. I have a few rolls stashed in the fridge waiting for a special occasion. 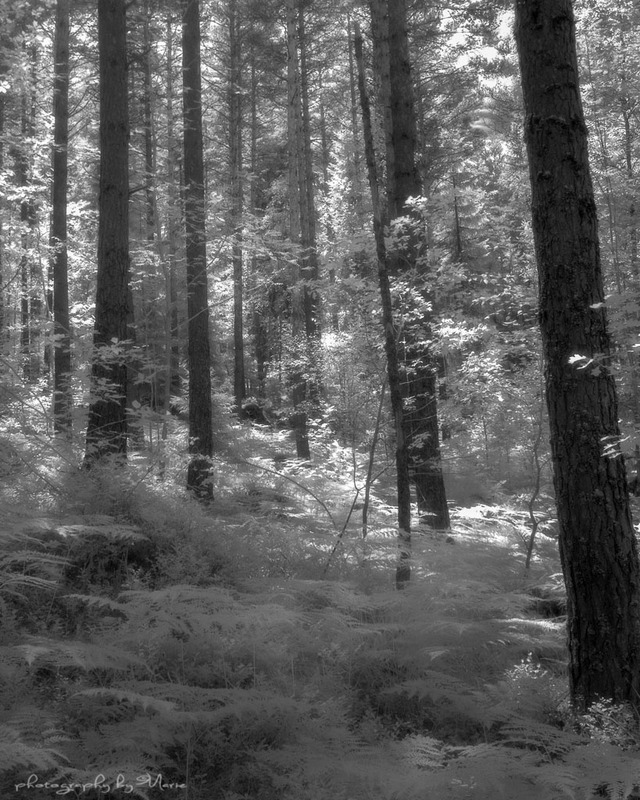 However, I have been getting good results so far shooting Rollei IR400. It’s not quite as dramatic as the Efke but it is slightly faster, sharper and much finer grained. It is I believe available in 4×5. Yes, Rollei IR400 is available in 4×5 too, and I have bought a box of it. 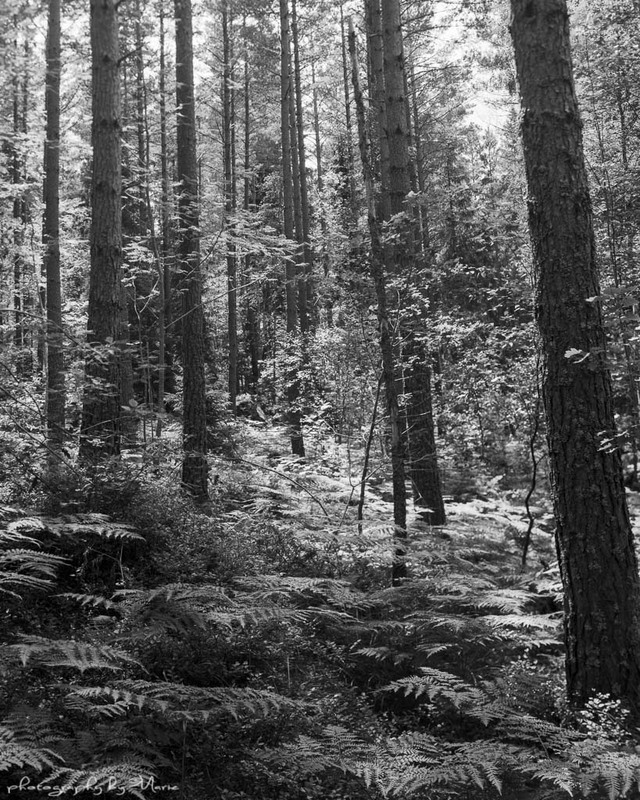 I do like it, and I have got quite good results when I overexpose it a bit, then it s close to Efke. I expose it too at ISO 3, with the IR filter, just as for Efke. But it is a pain to develop… The sheets are so thin they flop out from the mod54 holder. You have to develop in either a tray, or as I do, in a Jobo 3010 I so luckily found rather cheap…. I am just curious about the filter that you used for the IR shot (if any). Yes, I have a IR720, a round filter that fits the lens. For my pinhole IR, I use a Wratten 89B, that I cut to fit in a holder. I have found out that both Efke IR and Rollei IR gives me wonderful results when I expose at ISO 3, and develop with Kodak Tmax developer 1:4 for 7 minutes. Underbara bilder – jag tycker om båda, fast IR är speciellt! Ja visst är det något speciellt med IR, som du säger, det förstärker effekten. Jag tänker ta mina IR negativ med mig in i mörkrummet och göra lith kopior, men det får vänta lite tills fram emot hösten, men jag ser verkligen fram emot det. Hoppas din kväll var fin också! I was using a mixture of the Rollei and the Efke so I sort of mentally moved on….sort of….I might just have a quick look on the bay. I have tried Rollei too, and it is actually quite good. The second one for me is more real. I remember that kind of light in the wood from my childhood. In the early morning there is kind of light fog in the forest and sunrise is looking absolutely similar like on your picture. Great! Yes, I do need an IR filter. 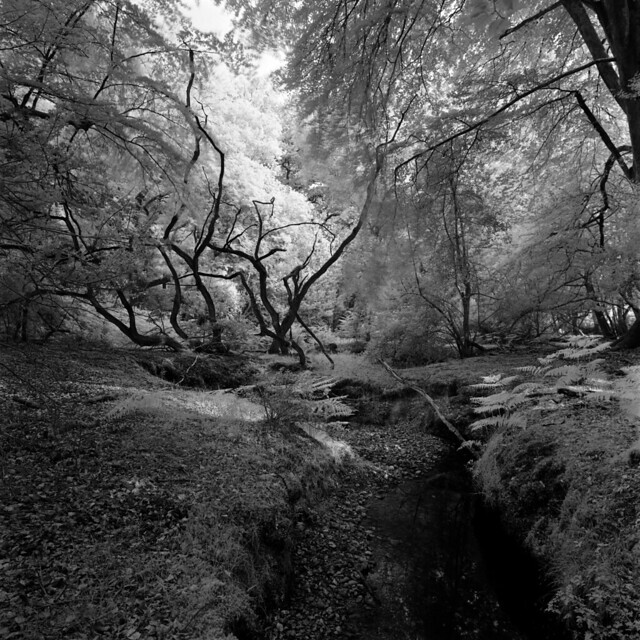 For my Hassie and Wista 45, I use a IR720 filter, there is many different ones on the market, and for my pinhole cams I use a Wratten 89B, that I cut to fit the camera. If you don’t use filter, you gonna loose the IR effect, it’s gonna look as a regular bw film. You are more than welcome Marie and a huge thanks for the info regarding the IR Filters……off to do some shopping for a filter.